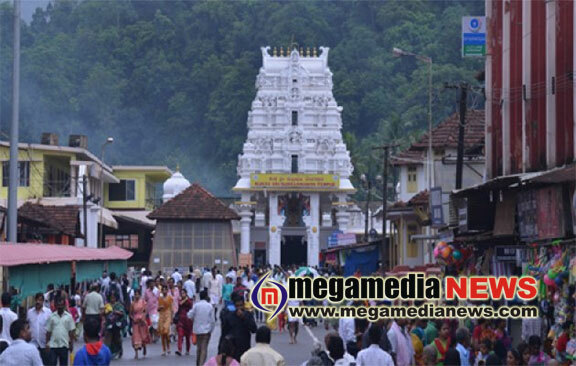 Subramanya: Subramanya temple has retained its number one position as the highest income generating temple of all the Muzarai temples in the state. The current year’s income is 95,92,54,363 rupees gaining 6,26,63,001 rupees more to last year’s collection informed the temple logistics committee president Nityananda Mundodi. The temple generates its income from sevas, charity box, bank interest, ‘chatra’ rent and rent from buildings. The financial income of the temple in 2016-17 was 89,65,91,361. This year the temple generated 40,48,16,090 rupees from sevas, 20,53,41,040 from charity box, 14,65,778 from its own farms, 2,48,05,682 rupees rent from buildings, 19,43,54,119 rupees interest from various banks, 2,79,16,625 rupees for ‘chatra’ rent and 7,91,93,881 rupees from other sources. The income of the temple in 2006-7 was 19.76 crore rupees. In 2007-08 its income reached 24.44 crore rupees and became the richest temple in the state. It has maintained its numero uno position as the highest income generating temple since 6 years. Since there is an increase in income by 6 crore rupees, its number one position will retain itself. The result will be known after income calculations of all the Muzarai temples in the state has been done.